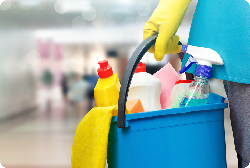 Keep up your store’s standards for cleanliness with training for Cleaning Interior Shelves. This online training module provides a simple method for thorough and efficient shelf cleaning and offers tips for keeping the work area safe while completing this task. Employees also learn best practices for rotating inventory, checking for freshness and disposing of expired and damaged goods.